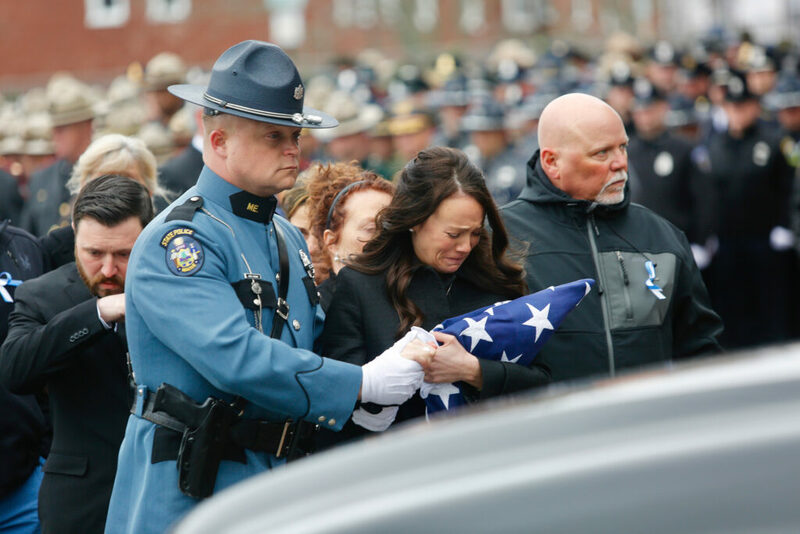 Hilary Campbell, widow of fallen Maine State Police Detective Benjamin Campbell, receives the flag that had draped her husband's casket, at the end of his funeral on Tuesday at Cross Insurance Arena in Portland. 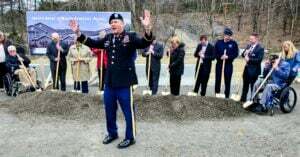 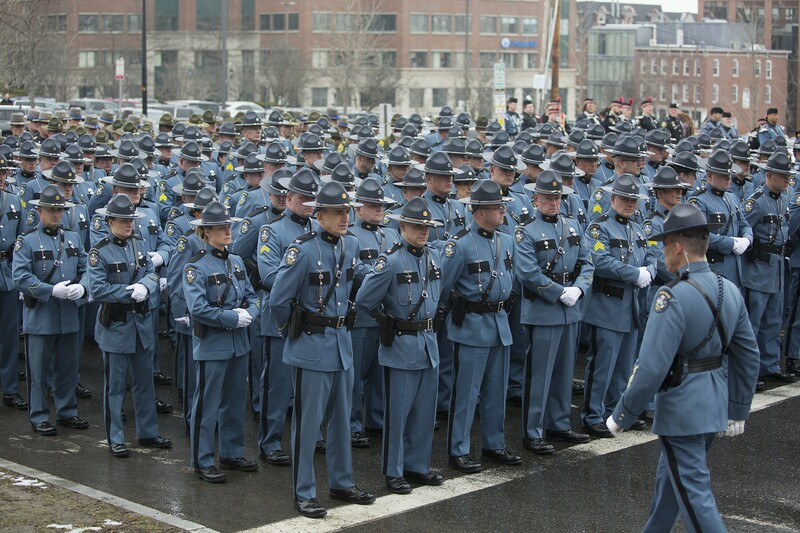 Giving her the flag is Col. John Cote, the chief of Maine State Police. 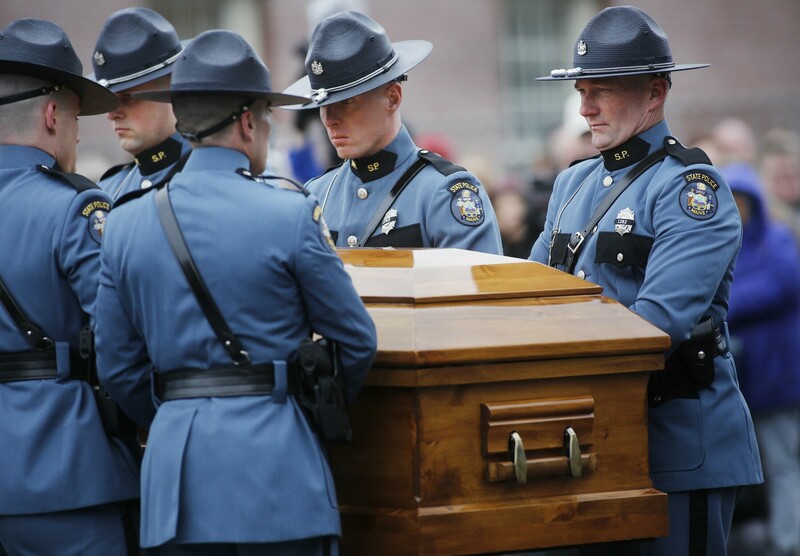 The casket containing the remains of Detective Benjamin Campbell arrives at the Cross Insurance Arena in Portland on Tuesday. 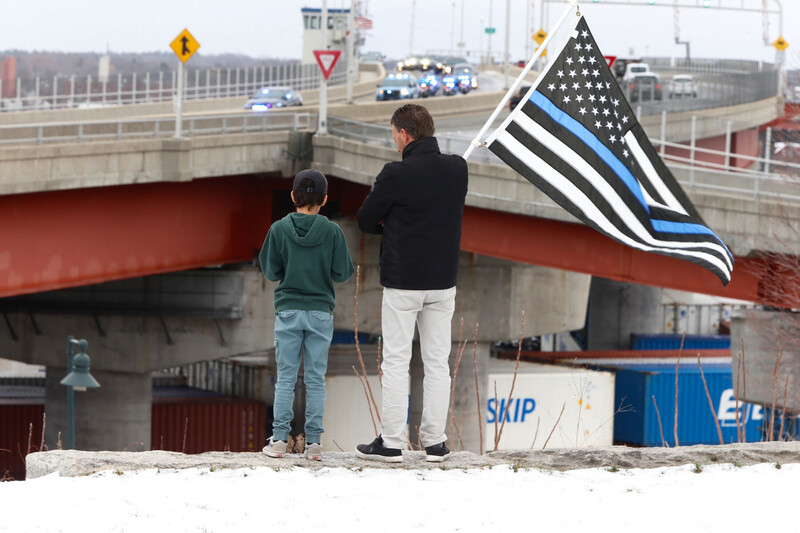 Tim Seavey of Westbrook holds a Thin Blue Line flag next to his grandson Ladainian Seavey at Harbor View Memorial Park in Portland as a motorcade accompanies fallen Maine State Police Detective Benjamin Campbell’s casket across Casco Bay Bridge toward his funeral at Cross Insurance Arena on Tuesday. Maine State Police troopers wait in silence before the funeral for fellow trooper Detective Benjamin Campbell. 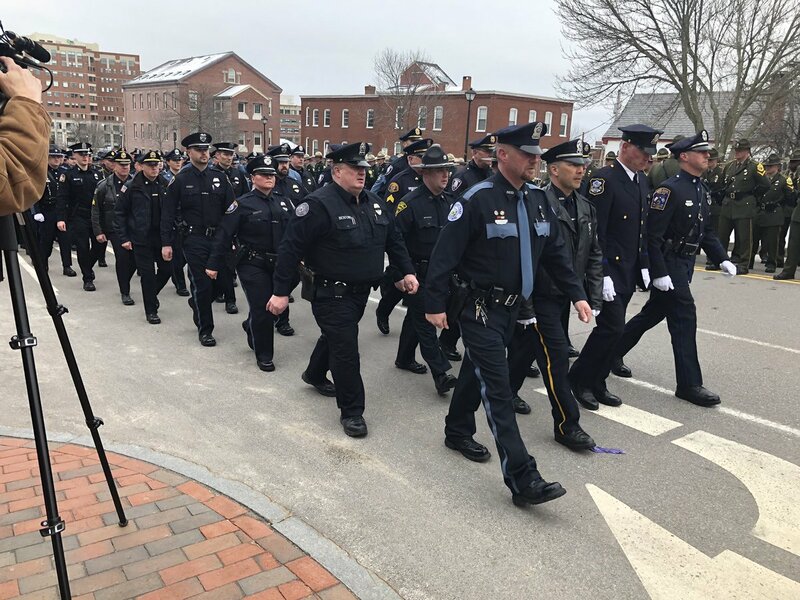 A contingent of police officers from a variety of law enforcement agencies march into place for the funeral procession to honor Maine State Police Detective Benjamin Campbell. 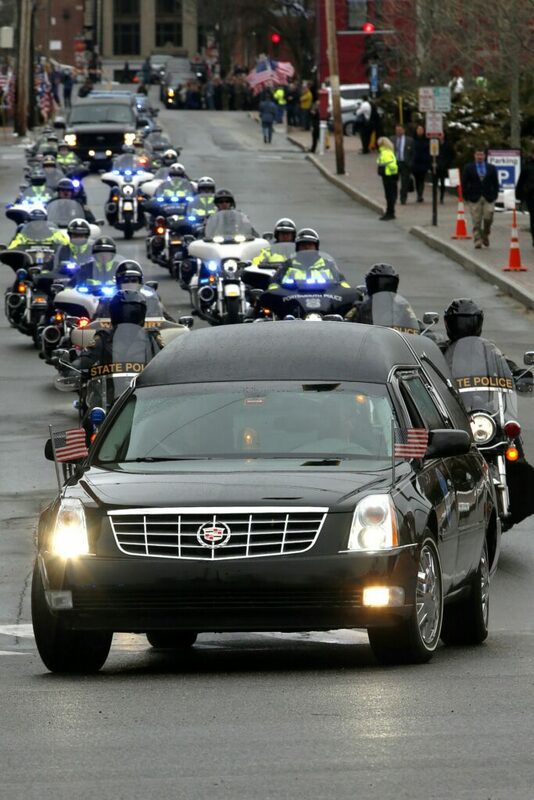 The hearse carrying the body of Maine State Police Detective Benjamin Campbell arrives at Cross Insurance Arena in Portland. 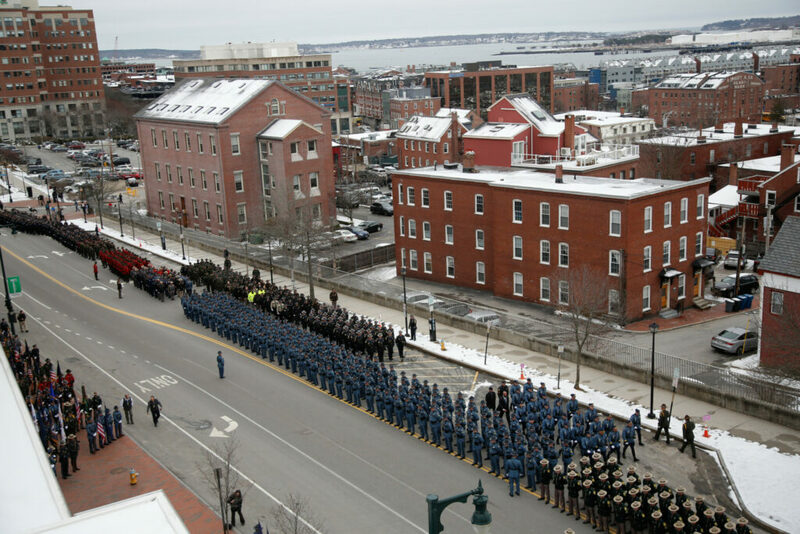 Thousands gather in Portland to honor fallen Maine State Police Detective Benjamin J. Campbell, 31, who was killed by a truck tire last week while helping a motorist on Interstate 95. 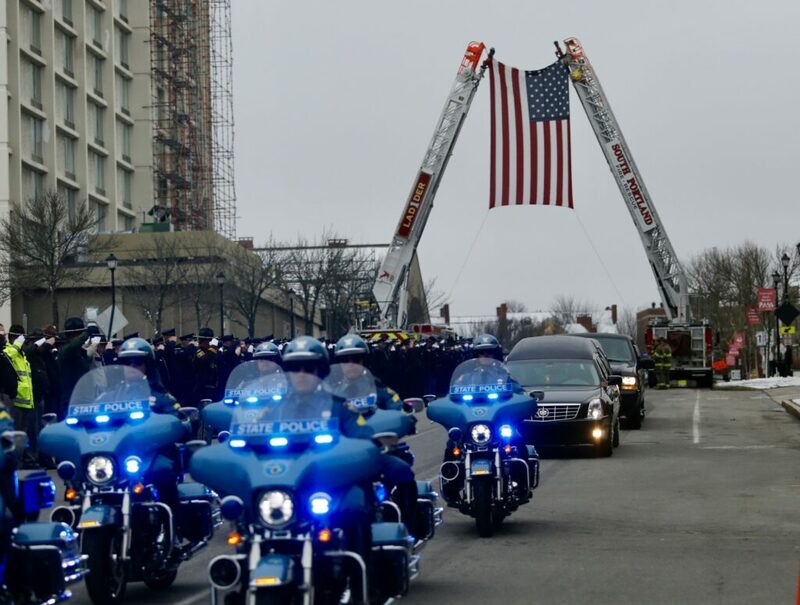 Detective Benjamin Campbell's casket arrives at the Cross Insurance Arena on Tuesday. 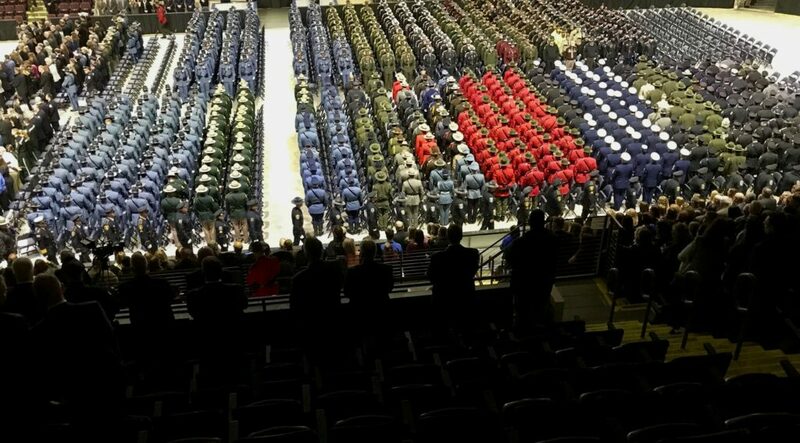 Hundreds of law enforcement officials gather at Cross Insurance Arena for the funeral of Maine State Police Detective Benjamin Campbell. 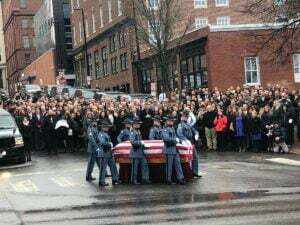 Members of law enforcement salute as the casket of Maine State Police Detective Benjamin Campbell passes during his funeral in Portland. 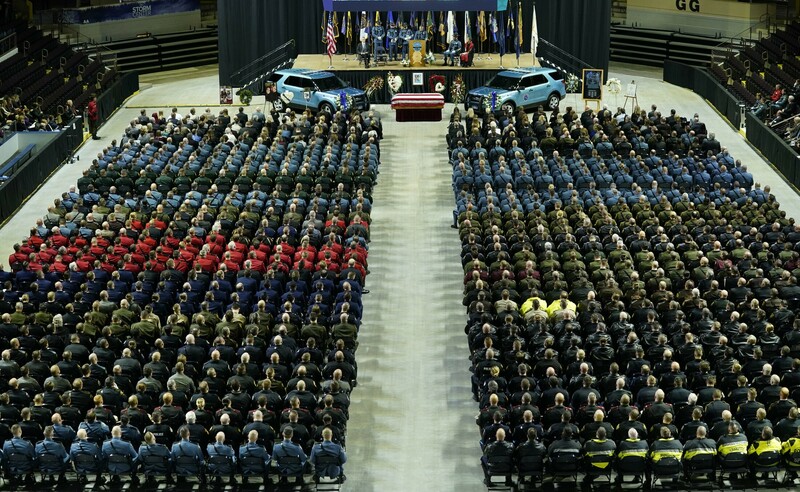 Supervisor Terry James of the Maine State Police speaks at the memorial service for Detective Benjamin Campbell at the Cross Insurance Arena. 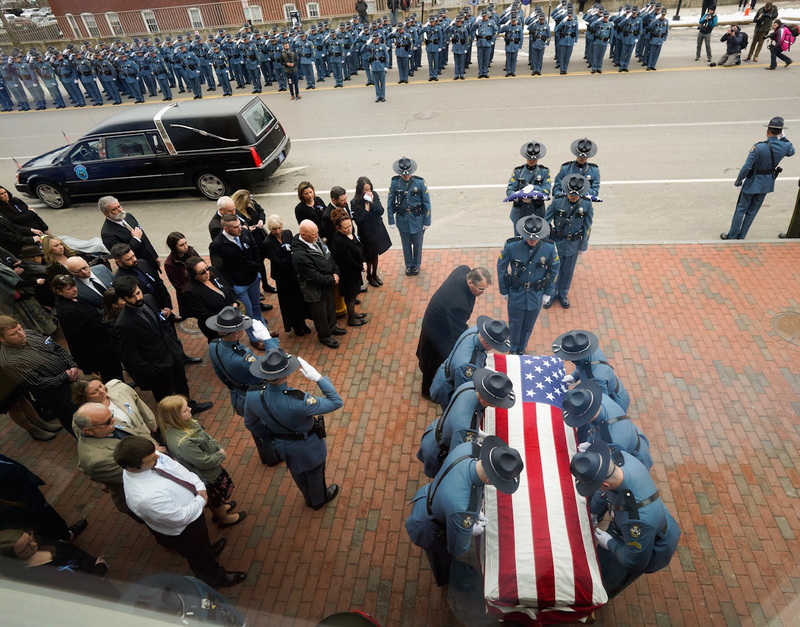 The casket of Maine State Police Det. Benjamin Campbell is carried out of the Cross Insurance Arena in Portland. 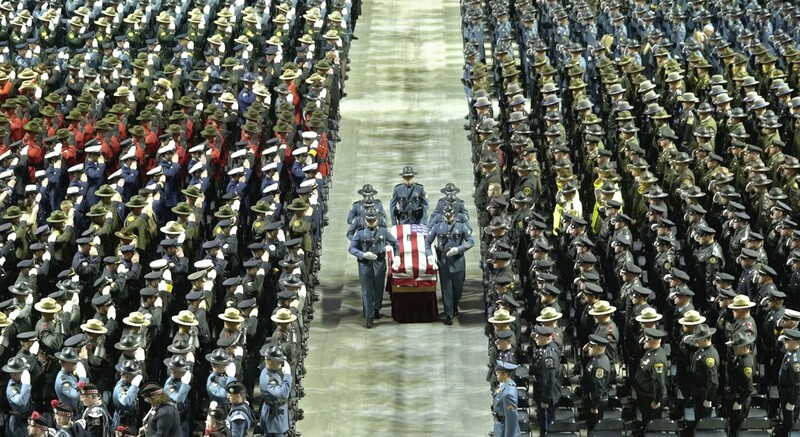 Maine State Police troopers move the casket bearing the remains of Detective Benjamin Campbell toward the Cross Insurance Arena. 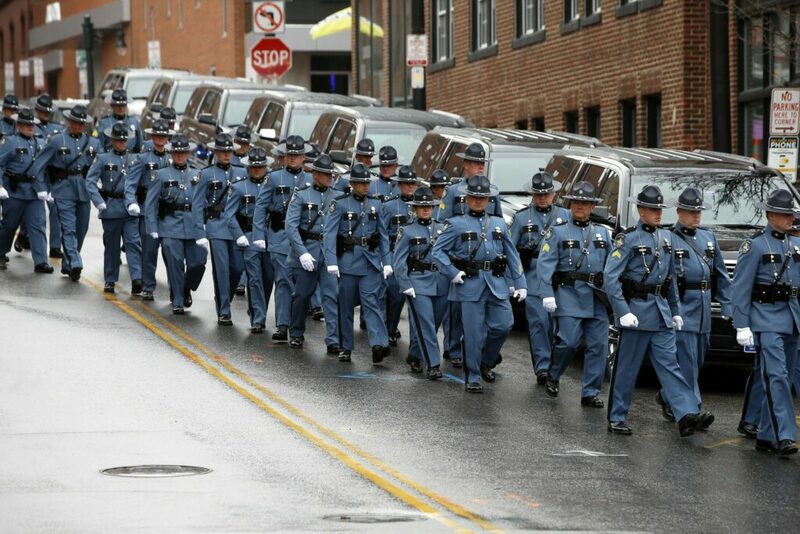 Maine State Police file out of Cross Insurance Arena on Tuesday after the funeral for Detective Benjamin Campbell. 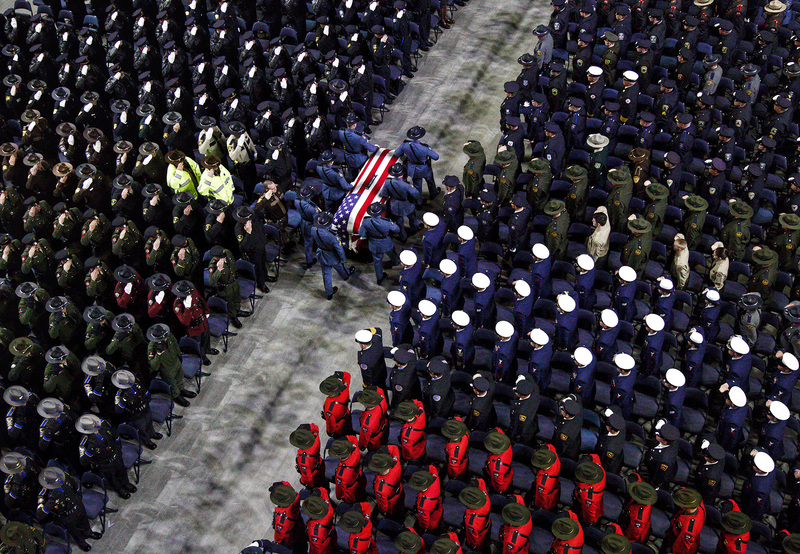 Hilary Campbell carries the flag that wrapped the casket of her husband after his funeral Tuesday at the Cross Arena in Portland. 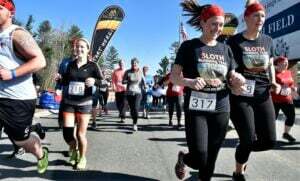 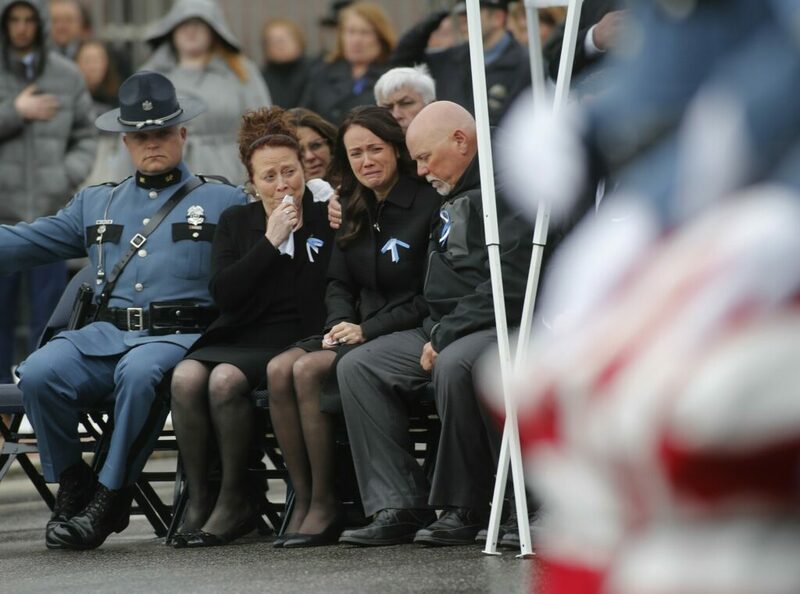 Maine State Police detective Jarod Stedman is on the left. A hearse carrying the Benjamin Campbell's casket descends Center Street before rounding onto Commercial Street after Campbell's funeral on Tuesday at Cross Insurance Arena. 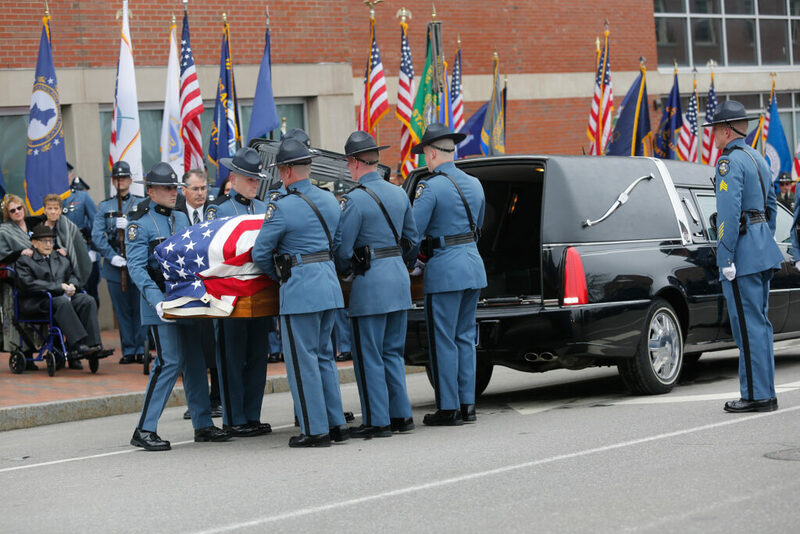 Maine State Police officers carry the casket of fallen Maine State Police detective Benjamin Campbell following his funeral service at Cross Insurance Arena. 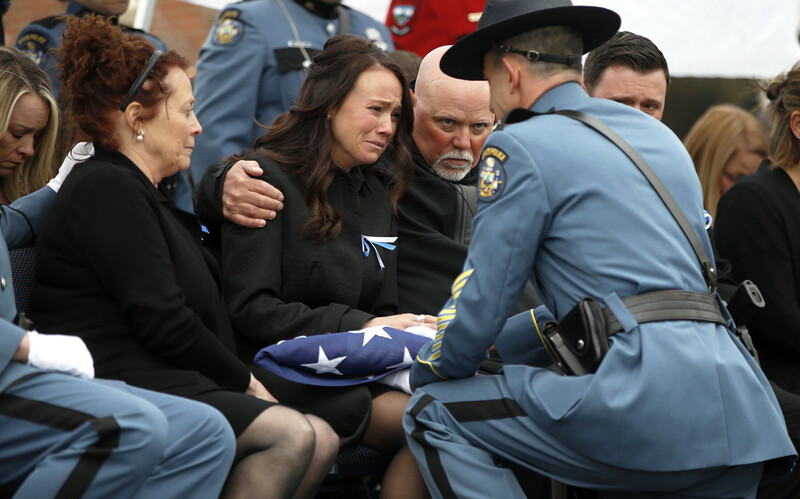 Hilary Campbell is comforted by her parents, Lisa and Steve Arsenault, at the culmination of the funeral service for her husband, Detective Benjamin Campbell. 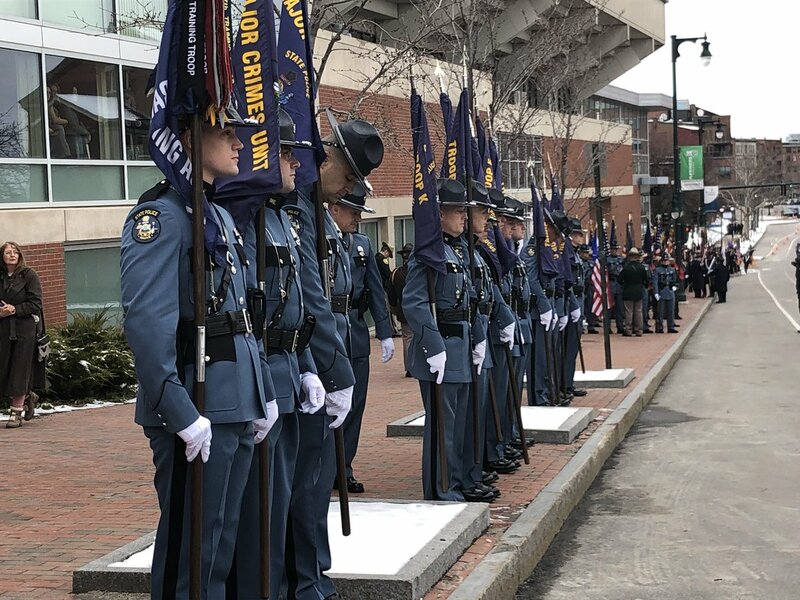 Maine State Police officers fall into formation during the funeral service for fallen Maine State Police Detective Benjamin Campbell. 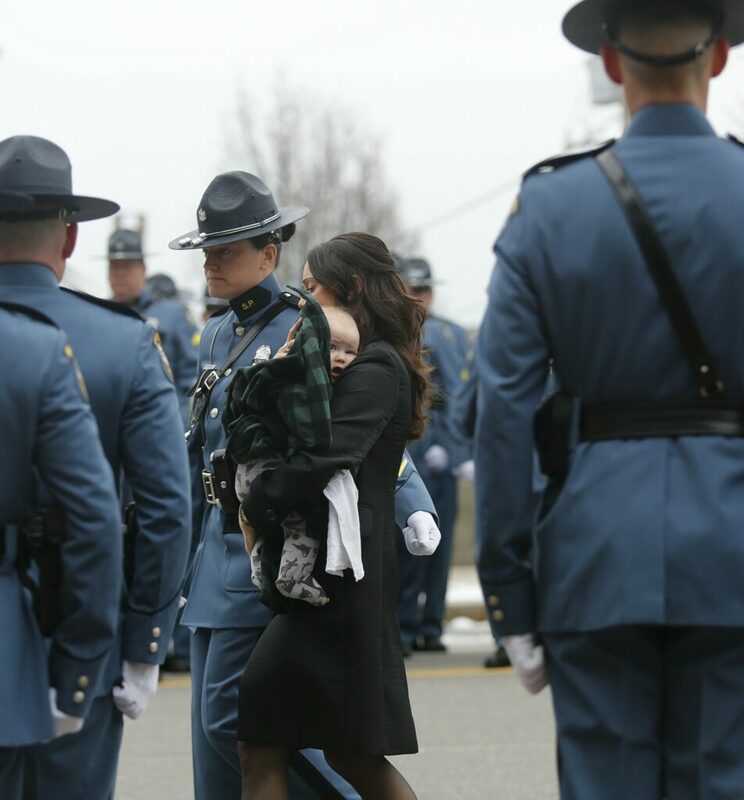 Hilary Campbell carries her son, Everett, as she is escorted to the funeral service for her husband on Tuesday.